1 Answer Amazon Echo Quiz and win Echo from Amazon? 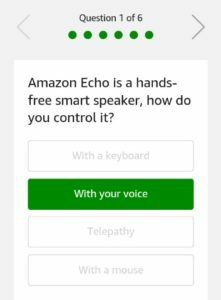 2.1 Q1) Amazon Echo is a hands-free smart speaker, how do you control it? 2.3 Q2) Which of these can you NOT do with your Echo device? 2.5 Q3) You can book a flight on Goibibo using your Echo device. 2.7 Q4) What is the voice and brain behind the Echo device called? 2.9 Q5) Which of these can Alexa NOT do? 2.11 Q6) On your Echo device, you can ask Alexa to turn on compatible smart lights. This time Amazon is back with its Echo quiz. Amazon Echo is a hands-free smart speaker that you control using your voice. It connects to Alexa – a cloud based voice service to play music, make calls, check weather and news, set alarms, control smart home devices, and much more. You have to answer 6 simple questions to win Amazon Echo. So, just check Amazon Echo Quiz Answer for more details. This Quiz at the last of the Homepage in the Amazon App. You will see the above shown image of Amazon Echo Quiz. 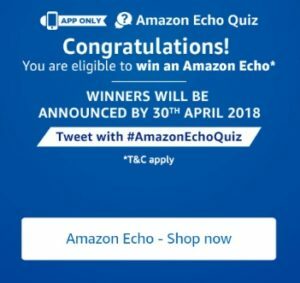 Check all the answers of Echo Quiz as twenty winners will be selected in this Amazon Echo Quiz. There are total of 6 questions that will be asked about this Echo device. Questions are very simple which are promoting the features of Amazon Echo. Answer Amazon Echo Quiz and win Echo from Amazon? 2. 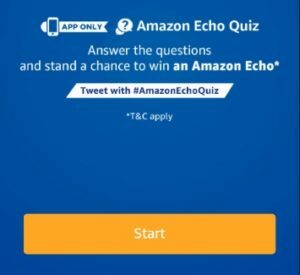 Open the app and you will see a banner about the Echo Quiz Time contest. Click on it. Q1) Amazon Echo is a hands-free smart speaker, how do you control it? Q2) Which of these can you NOT do with your Echo device? Q3) You can book a flight on Goibibo using your Echo device. Q4) What is the voice and brain behind the Echo device called? Q5) Which of these can Alexa NOT do? Q6) On your Echo device, you can ask Alexa to turn on compatible smart lights. 5. After answering all 6 questions correctly, you will get a Congratulations message that you have been entered into a lucky draw. There are a total of 20 (Twenty) Prize(s) that will be given under this Contest. The Prize will be delivered to the winner on or before 30th May 2018. 1. This Contest will commence on 19th March 2017 from 12:00:01 a.m. to 15th April 11:59:00 p.m.
6. The declared winner(s) will be eligible for winning an Amazon Echo device (hereinafter referred to as “Prize(s)”).